In this excerpt from The Age of Spiritual Machines (Viking, 1999), Ray Kurzweil recalls the history of Kurzweil Educational Systems. In 1996, working together with a brilliant team of scientists and managers who had earlier worked for the original Kurzweil Computer Products or its successor company, I founded a new reading technology company called Kurzweil Educational Systems, Inc., which has developed a new generation of print-to-speech reading software for sighted persons with reading disabilities, as well as a new reading machine for blind people. The reading disabilities version, called the Kurzweil 3000, scans a printed document, displays the page just as it appears in the original document (e.g., book, magazine), with all of the color graphics and pictures intact. It then reads the document out loud while highlighting the image of the print as it is being read. It essentially does what a reading teacher does - reading to a pupil while pointing out exactly what is being read. It is the applications of the technology benefiting disabled people that have brought me the greatest gratification. There is a fortuitous match between the capabilities of contemporary computers and the needs of a disabled person. We're not creating cybernetic geniuses today  not yet. The intelligence of our present-day intelligent computers is narrow, which can provide effective solutions for the narrow deficits of most disabled persons. The restricted intelligence of the machine works effectively with the broad and flexible intelligence of the disabled person. Overcoming the handicaps associated with disabilities using AI technologies has long been a personal goal of mine. With regard to the major physical and sensory disabilities, I believe that in a couple of decades, we will come to herald the effective end of handicaps. As amplifiers of human thought, computers have great potential to assist human expression and to expand creativity for all of us. I hope to continue playing a role in harnessing this potential. 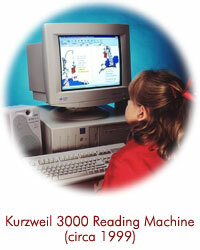 Kurzweil Educational Systems©, Inc. was founded in 1996 from the roots of Ray Kurzweil's Kurzweil Reading Machine. Today, the company is recognized as the leading developer of text-to-speech technology for people with learning disabilities and those who are blind or visually impaired. Kurzweil Educational currently offers Kurzweil 1000 for Windows©, Kurzweil 3000© for Windows and Macintosh. All products incorporate a robust set of easy-to-use features for reading scanned or digital text, writing, study and test-taking accommodations. In 2005, Kurzweil Educational Systems was acquired by Cambium Learning©, now known as Cambium Learning Group, the largest provider of educational materials in the area of special education. To our customers, partners and friends who strive, like us, to enhance learning and expand literacy, our mission is to positively change the lives of students who struggle to learn.